A few months back, I reported the return of Ravello with exciting new capabilities in the pipeline. Being a big fan of the technology, I was very excited to know what’s coming and couldn’t wait for its release. Today, I am pleased to say that Oracle is announcing the general availability of Ravello on Oracle Cloud Infrastructure. In the quest for moving workloads to the cloud, many enterprises stall at the first hurdle: How best to migrate workloads to a public cloud where not only the hypervisor technology in use is completely different but so are the network principles? This is especially true for sophisticated and/or distributed workloads that have been around for years and are still running on old infrastructure. Typically, the process is quite arduous e.g. Discovery, Re-Platform/Conversion, Network Changes etc., while making sure the application still behaves identically and with no performance degradation. Multiply this by the number of applications and you can see why it causes such a headache for enterprises. Ravello makes it all easy by enabling migration of VMware-based workloads “as is” and even without any changes to networking. This is made possible due to Ravello’s HVX Hypervisor technology which abstracts the hardware, storage, and networking, thereby enabling any VMware workload to seamlessly move to the destination public cloud. I hear you say. It’s a fair question as Ravello been able to do that for a while. What’s different this time is that being an Oracle product now, it is able to have access to Hardware-Assisted virtualization or even run “Bare Metal” on Oracle Cloud Infrastructure; something other cloud providers would not allow access to. For that reason, there is a huge increase in performance, enabling Pre-Production or Production workloads to seamlessly migrate to the Oracle Cloud Infrastructure and not suffer any performance degradation. In fact, once migrated, all the resources available in the cloud to scale the infrastructure become available. Then there’s the ability to have bigger virtual machines. As it stands, the VMs can go up to 32x vCPU and 200 GB RAM and I am sure this capability will only grow with time. Due to being a vExpert, I was fortunate enough to get early access to this new capability. Due to work, VMworld and other commitments, I wasn’t able to do a full systematic test/comparison of performance but I did do a basic, non-scientific test by deploying Alastair Cooke’s famous AutoLab 2.6, which is available as a “Blueprint” in the Ravello Repo. It used to take a couple of hours to deploy the lab, with frequent status checks on it. Now, it takes less than half an hour and even that’s in between doing other things. Some of the problems that occurred due to sluggish performance e.g. having to restart PXE boot on the hosts during deployment, have completely disappeared and there is absolutely no sluggishness after the build. I must mention that to keep things comparable, I did not change the hardware configuration of any of the machines in the blueprint. One would expect at least this much performance improvement by switching to a Bare Metal environment but the fact that it’s now possible, makes it so exciting and will open doors to do so much more. The benefits of moving to workloads to public cloud are well-known and bar a few exceptions, almost all workloads can benefit from making that transition. Depending on the workload, there are also potential savings to be made from making the switch from CAPEX to an OPEX model. Performance fears and migration pains are the two biggest hurdles that make enterprises weary of making the move to the public cloud. 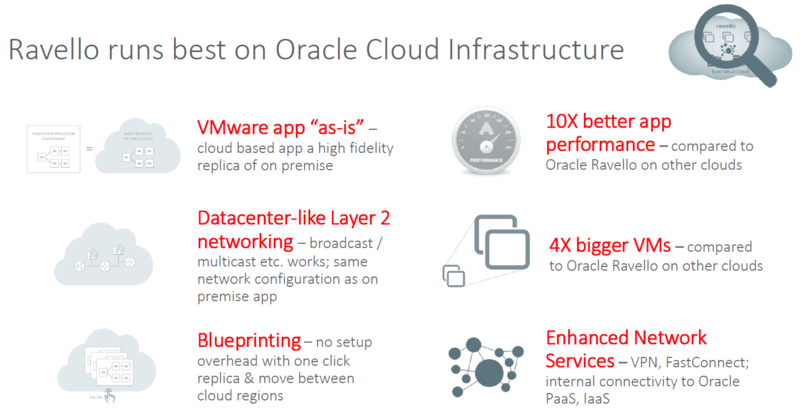 Ravello running natively on Oracle Cloud Infrastructure solves both those problems, making it a very attractive proposition. As an architect, the ability to move traditional workloads to the public cloud, excites me very much because of all the integration capabilities (with cloud-native services) that become possible, due to proximity. If you are interested in trying Ravello on Oracle Cloud Infrastructure, sign-up for a free trial or drop them a mail.